In the U.S., net neutrality is under attack. Ajit Pai, current Chairman of the FCC, put it bluntly: “We need to fire up the weed whacker” and remove rules like net neutrality, he said recently. To keep net neutrality (and a healthy internet) intact, Mozilla is deploying Paperstorm, our activism website developed alongside design studio Moniker. Over the next several weeks, we’re asking American internet users to send a salvo of tweets to Chairman Pai. How? Visit Paperstorm.it and start clicking. Each click drops a digital leaflet on the FCC’s headquarters in Washington, D.C. Drop enough leaflets and you can trigger a tweet to Pai. Paperstorm is a tongue-in-cheek website. But from past net neutrality efforts, we know that a loud chorus of voices can make an impact. And we need to make an impact quickly: Pai and the FCC commissioners are expected make a net neutrality decision in late fall or early winter of this year. In May of this year, Pai introduced his proposal to undo net neutrality by re-re-classifying Internet Service Providers (ISPs) from Title II to Title I under the Communications Act of 1934. What this means: Under Pai’s proposal, ISPs would be allowed to block, throttle and prioritize (or deprioritize) internet access for Americans. Companies like Comcast and AT&T could selectively slow down or speed up access to online journalism, blogs, films, apps, and other services. This would undo 2015’s hard-won net neutrality protections that took years of hard work. Net neutrality may seem like an abstract issue, but its impact is anything but. Without it, the internet becomes less open. No net neutrality means fewer opportunities for startups and entrepreneurs, and a chilling effect on innovation, free expression and choice online. 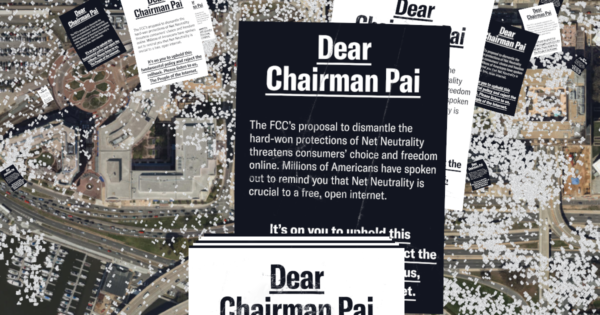 Paperstorm is a digital activism website that urges Pai and the FCC to keep net neutrality intact. What do these leaflets do? When you drop enough, you can generate a tweet to Pai. Alone, you might drop a small stack of leaflets and send a handful of tweets to Pai. But together, we can drop millions of leaflets and launch tens of thousands of tweets. Paperstorm is a collaboration between Mozilla and the Amsterdam-based, Webby award-winning design studio Moniker. This is the first time Mozilla and Moniker have deployed Paperstorm in the U.S. Earlier this year, Mozilla and Moniker deployed Paperstorm in the EU to demand common-sense copyright reform — we dropped 60,000,000 leaflets and sent 12,000 tweets to lawmakers. Millions of Americans across party lines support net neutrality. Over the past several months, more than 22 million net neutrality comments have been filed in the FCC’s docket, the vast majority in support of net neutrality. On July 11, hundreds of organizations banded together in a Day of Action to amplify Americans’ voices. From the ACLU and Amazon to Github and Mozilla, organizations voiced loud support for a free and open internet. Read about Mozilla’s past net neutrality advocacy.